Everything has a fishhook. There’s always a catch. 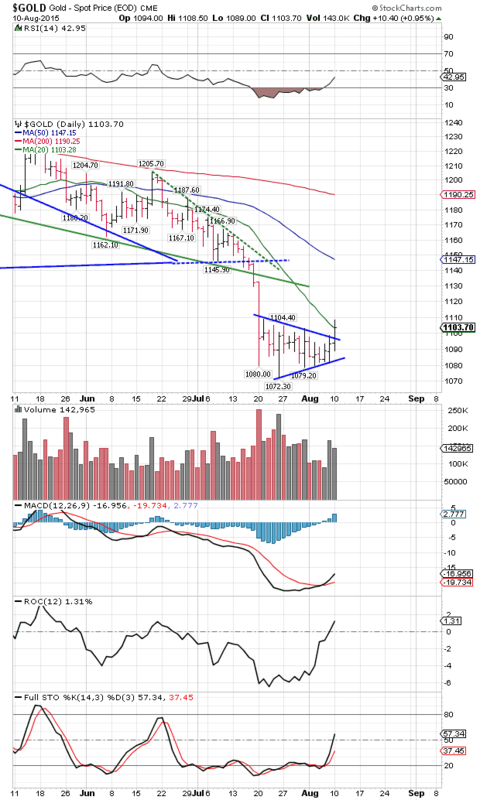 Catch in today’s SILVER and GOLD PRICES rally is that it might be only a rally in a continuing fall. Therefore it needs continuing higher confirmation. Personally I believe the long bear phase that began four years ago for silver and gold has ended. 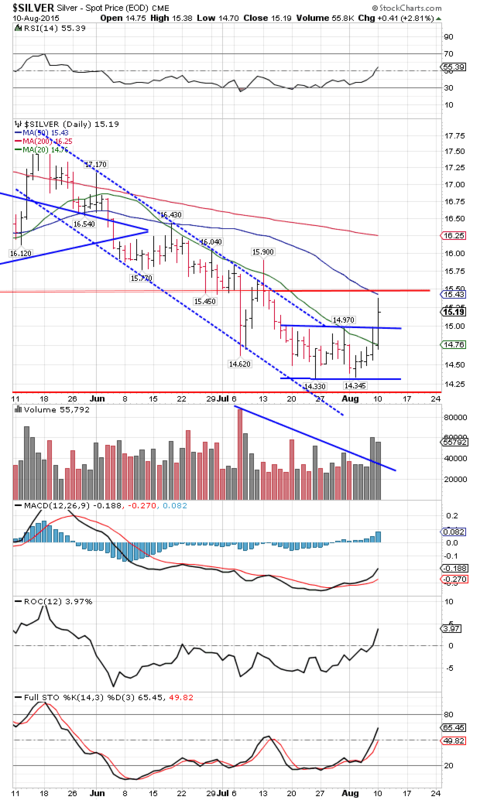 We saw a double bottom in silver last week as well as gold. Today they followed with strong breaks through resistance. Well, the gold price was the least bit ambiguous by not closing plumb through $1,105, but I reckon the Nice Government Men had to pull just a little bacon off the plate, to mess up the look of the rest. GOLD PRICE today rose $1.10 (0.9%) and closed Comex at $1,104.20. Silver gained 47.3 cents (3.2%) to $15.289. The GOLD/SILVER RATIO fell a weighty 2% to 72.222. Silver’s high reached $15.38, gold’s $1.108.50. This strong rally is the sign silver and gold prices have turned up. The price of gold broke out of an even- sided triangle and closed right above its 20 DMA ($1,103.28), first tripwire of a rally. This occurred in tandem with the MACD turning up, full stochastics, rate of change, and Relative Strength Index. Look at the chart on the right. The SILVER PRICE broke out of a rectangular range whose bottom boundary at $14.33 has been twice tested and verified. Friday Silver closed right at its 20 DMA , today it opened there and never looked back. Sliced through the top rectangle boundary and reached for the 50 DMA ($15.45) but couldn’t quite reach it. All the same indicators have turned up for silver, but notice it gained three times as much as the gold price today. Friends, you buy the breakouts, and this is one. Stocks had a big day which can be technically explained by the Dow bouncing up after penetrating its lower support boundary, and the S&P500 bouncing off its 200 DMA. One Reuters report had the astonishingly blockheaded sentence, “Disappointing economic data in China boosted hopes for additional stimulus from Beijing, lifting Chinese stocks.” Let’s see, things are getting better because the worse they get the closer China comes to government stimulus, which, as we always know, works like a square wheel. I pass over as too obvious for a gentleman to comment on, that Chinese government data, economic or otherwise, can be trusted like you can trust a heroin addict with your wallet. Dow rose 241.79 (1.39%) to 17,615.17 and the S&P500 jumped 26.61 (1.28%) to 2,104.18. In dollars, that is. If you measure the Dow in gold or silver, it all looks different. Dow in Silver today FELL 1.38% to 1,159.27 troy ounces. Dow in gold rose 0.44% to 15.96 oz. Both indicators have broken down through their 20 day moving averages and their uptrend lines. Evidence is piling up that the July new highs were indeed what I suspected, throwovers that mark a top. Day wouldn’t be complete without picking up a set of tongs and examining the moldy, scrofulous fiat currencies. Witnesses continue to testify that the US dollar index has posted its double top at 98.32/98.43. 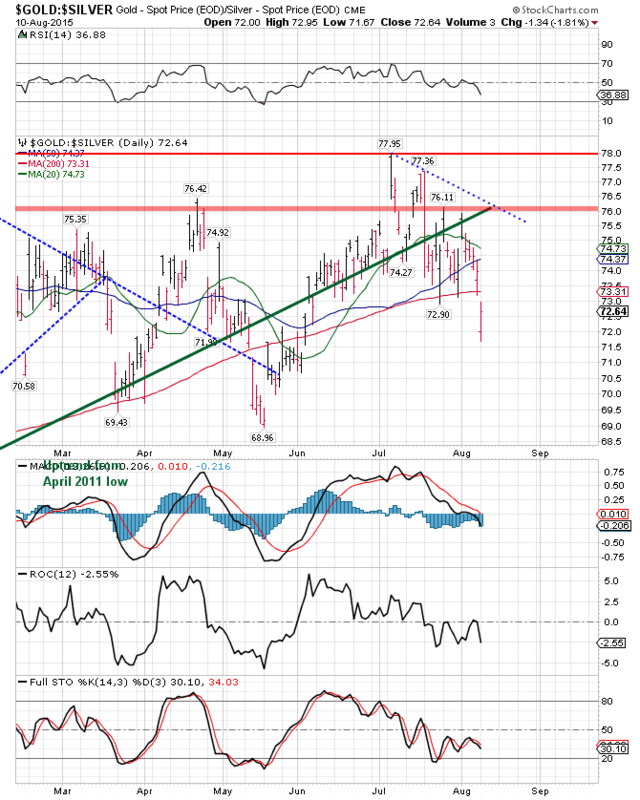 Dollar index lost another 42 basis points today (0.43%) and ended at 97.20, well below its 97.49 20 DMA. Momentum indicators have turned down. Scabby euro added 0.44% to $1.1021, while the Yen oozed off 0.31% to 80.26 c/Y100. Please remember y’all won’t be hearing from this nat’ral born durn Tennessee fool for the rest of this week because he will be in Virginia, annoying the folks up there. However, the picture right now is so clear even somebody with a Ph.D. working in Washington, DC, for the US Post Office or State Department could figure it out: silver and gold prices made their bottom last week and it’s time to buy.